Consult a physician if you have impaired kidney function or are taking any prescription medications that affect kidney function. Cellulose, stearic acid (vegetable source) croscarmellose sodium, silica and vegetarian coating. As a dietary supplement, take 3 tablets with fruit juice or other sweetened liquid 3 to 4 times daily, before and after exercise for the first 7 days. Thereafter, for maintenance use, consume 3 tablets 1 to 3 times daily. Allow 3 to 4 hours between doses. For continuous use beyond 28 days, use one serving (3 tablets) daily. 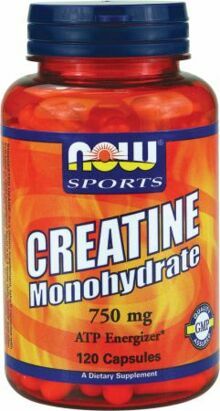 Consider taking NOW Creatine Monohydrate in combination with D-Ribose and Carbo Gain.